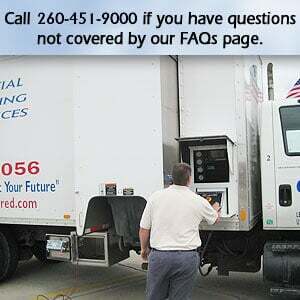 Why should we utilize a shredding service instead of just a recycling program? If security is important to your company, shredding should be as well. Recycling your information is a terrific idea but only after it is shredded. Recycling facilities offer NO security for your information. Your material is not only transported in unsecured vehicles, but delivered to a location with no security features. Your material is deposited in an area with public access, accessible to anyone! What happens to our material after it is shredded? All paper and paper products are recycled. Bulk shredding is charged by the pound. No time charges. You are charged for the material that you have shredded. You are not charged time charges which could penalize you for slow equipment or workers. All material is weighed prior to the shredding process. We have a built in, calibrated, sealed scale on board the shredding vehicle. Why employ a shredding service instead of using/buying our own shredder? Cost effectiveness. It will cost you more money to do the shredding in-house rather than have our service do it for you! You will save money in not only the cost of the shredder, maintenance and disposal, but large labor costs as well. Our friendly and professional staff is here to answer any questions you may have about our company or our services. Whatever your shredding needs, we can provide it to you at prices you can afford. Absolutely not! Strip shredding is a very inefficient method of shredding documents. Material that is strip shredded can easily be reconstructed. Our equipment -- with a special system of 42 rotating knives -- randomly rips, tears and compacts the documents into very small pieces. This makes it virtually impossible for reconstruction! Do you provide documentation for our compliance records? Yes. All shredding completed will be provided with a certificate of destruction for your records. Do we need to provide you with a check at time of service? An invoice will be generated and sent after completion of the shredding process. We offer payment via credit cards for your convenience. Please note that there is a small service charge for Credit Card payments. Yes, we can provide a business associate agreement for you. Why use CSS for document shredding? Got a question we didn't answer? Call us today and we'll set your mind at ease.